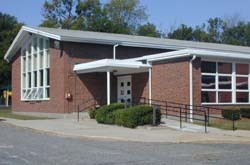 We are housed in the Fisk United Methodist Church of Natick. Nestled in the Walnut Hill neighborhood of Natick, we enjoy the quiet of nearby homes, though still just a few minutes away from the hustle and bustle of downtown Natick. Please enter our school by using the ramp entrance opposite the playground. Our entry door is locked, ring the door bell and our staff will bring you to the office to meet our director. Inside our building, our classrooms are on the first floor. We have a separate classroom for each of our three age groups, a full size kitchen, an office, and two child-sized bathrooms. We have an additional bathroom for changing pull ups. Each classroom offers a wonderful play space for young children. 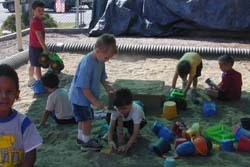 Areas include dramatic play, block, toy, quiet and art. Furniture is child size. Our side rooms have air conditioning and all have large windows for natural light. Our fenced in playground has a child safe mulch surface, a 15 feet by 15 feet sandbox (covered by a sun screen to provide plenty of shade), a large climber (appropriate for pre-schoolers) with two towers, two slides, and a bridge with easy access by stairs or ladder. 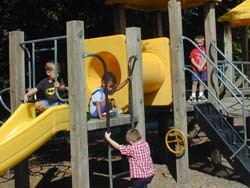 A smaller slide/ climber for the younger set and swings. We have a beautiful field for pre-school style soccer and baseball games as well as kite flying and just running! Our (non car) driveway is great for trike riding and chalk drawing.